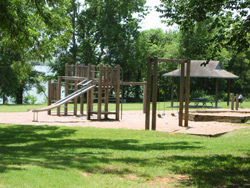 Loyd Park is located on the northwestern shore of Joe Pool Lake. The park offers visitors an opportunity to pursue a wide range of outdoor pursuits. These webpages about the park are designed to provide you with the information you need to plan your next visit. This page contains an overview of many of the park's amenities. There are also pages where you can find out about camping, rental cabins, the boat launch, or get driving directions to the park. Navigation links on the left side of the page provide links to these other pages and there are also links found throughout the text below. There is a per car entry fee ($10 - $20) that varies with the day of the week and holidays. This fee covers a maximum of 6 people per vehicle. Additional people will incur additional fees. You can also purchase a Grand Prarie Annual pass. Loyd Park is open 24 hours a day. 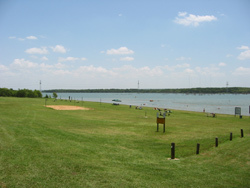 The swimming beach is a grassy field that extends to the shoreline of Joe Pool Lake. This area also boasts a few picnic tables and a volleyball court. There is no lifeguard present, there are no glass bottles allowed, and you cannot bring any pets to this area. The park's main parking lot, a bathroom with a changing room, a concession stand, and a playground are all found adjacent to the swimming beach. 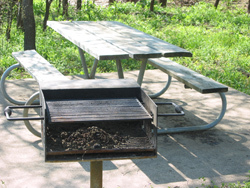 There are many covered picnic tables in various areas of the park; at each campsite, around the beach and playground, and in a few other areas. Most of the tables are on a concrete pad and have a barbeque grill located just off one edge of the concrete. Loyd Park has two group pavilions. Pavilion "H" has seating for 80 people, a baseball field, parking for ~ 40 vehicles, and a restroom facility. Pavilion "I" also has seating for ~ 80 people. The beach, and its facilities (restroom, changing room, concession stand, playground, volleyball court, and its parking area), are also close at hand. You must reserve and pay a fee to use these park facilities, and you must still pay the the per vehicle entrance fee to enter the park for everyone who is using a rented group pavilion. Loyd Park has six miles of multi-use trails. 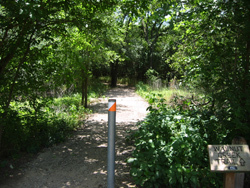 The main trail, Walnut Creek, can be used for for hiking, biking, and horseback riding. The trails are relatively easy. If you are in the park and want to go for a walk their great. You can also check out the Joe Pool Lake Hiking page to learn more about other trails around the lakes. Cedar Hill State Park Trails, in particular, are quite nice. Dogs are allowed on the trails in Loyd park provided they are on a leash. If you have children, there is a small playground at Loyd Park where you can take them to play. It is located near the main entrance of the park and is close to the swimming area. If you enjoy a game of volleyball there is a court at the beach. The group pavilion area "H" has its own ball field. It does not have a dirt infield but there is a backstop and some bleachers for the fans. This website is not affiliated with Loyd Park, park management or the City of Grand Prairie. You can find more details about fees, reservations and other information at the Grand Prairie Loyd Park website. 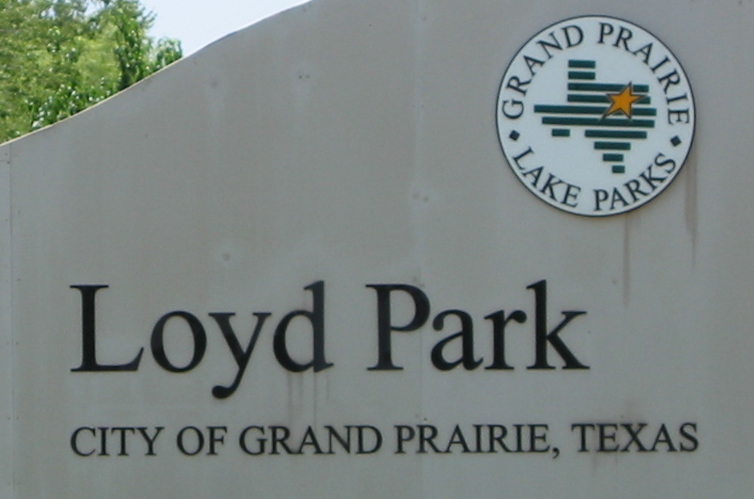 Loyd Park is located off of Ragland Road, east of SH 360, in Grand Prairie, Texas. If you were looking for Lloyd Park you have probably found the right park. 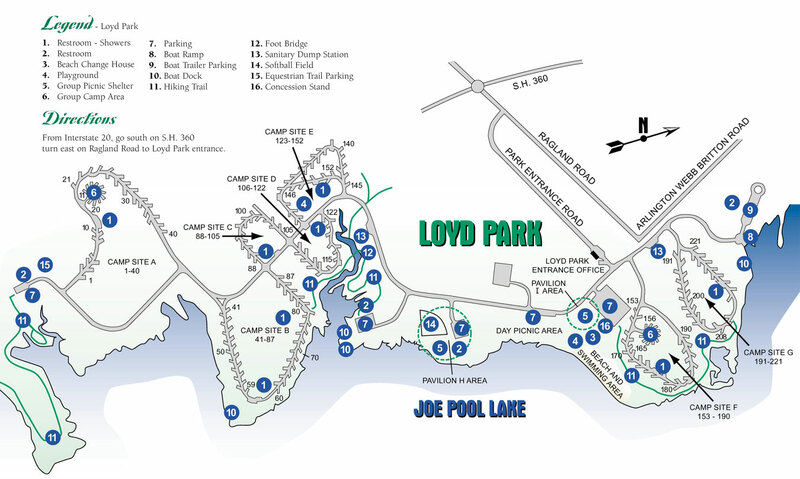 Many folks mistakenly assume the Loyd in the park name is spelled Lloyd .